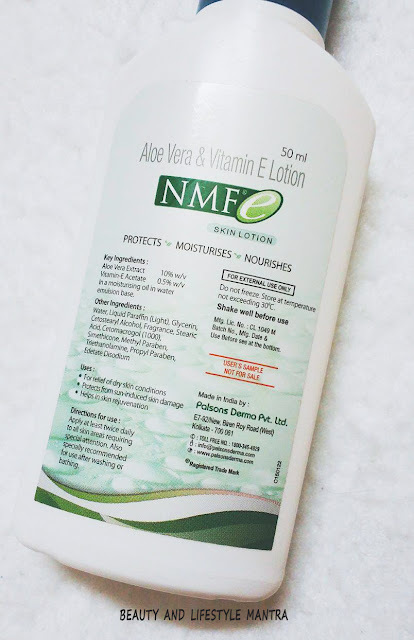 Today I am going to review Aloe Vera & Vitamin E Skin Lotion from Palsons Derma. This is a medicated skin care lotion. Specifically NMF Skin Lotion formulated to hydrate Dry and Sensitive Skin. It is also helps in healing of damaged skin associated with common skin conditions. It Prevents sun-induced skin damage and Helps in skin rejuvenation. 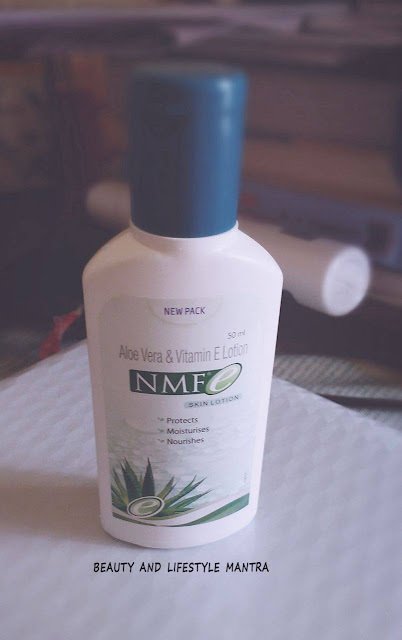 This Aloe Vera & Vitamin E NMF lotion comes in a simple flat type plastic bottle with a sturdy flip cap which is green in color. This packing is quite travel friendly. It has a soft, runny consistency. I have been using this NMF skin lotion since 2-3 years. I use it on my face as well as dry parts of the body mainly elbows, knees, and ankles areas. Usually, I apply this lotion after shower and some time at night. I really love the texture of the lotion. It feels very light and quickly gets absorbed into my skin. It doesn't feel sticky. 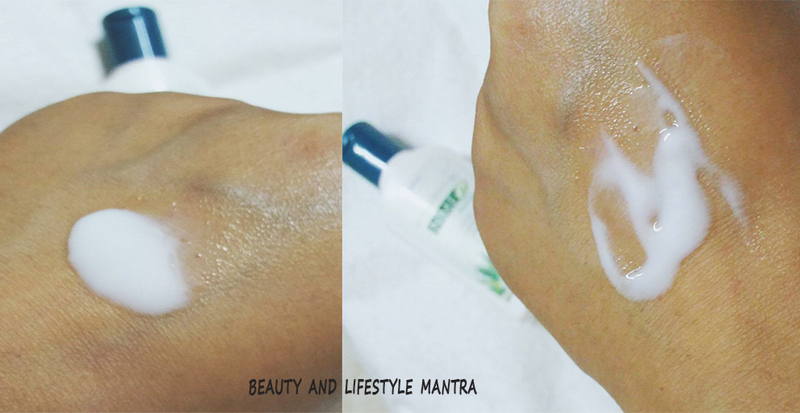 When I apply the lotion on the skin it gives a very cooling and refreshing feeling. Aloe Vera & Vitamin E NMF Skin Lotion works very nicely. It moisturizes my skin and provides a soft hydrated skin for 6 to 7 hours. This is a good lotion for the summer with the soothing and refreshing smell. The same lotion I am using for my baby boy. His skin is to much sensitive. Some redness and rashes were seen on his body When it was too hot. Then my father (he is a pediatrician) suggest me this lotion for him. Over the past three months I've been using it for his. The lotion has suits my baby. It hides the sings of dryness or patchiness of his skin. As well as this lotion prevents his skin rashes and redness. I think regular uses of the lotion repair his skin texture nicely. I am using a 50 ml sample size product which goes for 2 months for both. Actually, I think after the shower is the best time to apply any lotion or moisturizer when skin is damp and you required a very tiny amount of product. Anyways in market 100 ml and 200 ml size is available which cost 160 Rs and 230 Rs. Overall, this is a good lotion for the summer those who have normal, dry and sensitive skin. It contains Vitamin E and Aloe Vera. Vitamin E helps to relieves from skin irritation and Aloe Vera is a natural ingredient that moisturizes and softens the skin. These two provide a quick relief against dry skin problems and helps in maintain the smoothness and natural moisturizer of skin. This lotion looks hydrating. Great review! It's my HG moisturizer, have been using it for more than 5 years :) And you are doing absolutely right, it's equally good for babies too! Well reviewed. Looks and sounds good! And if it is good enough to be used on a baby's skin, it will definitely suit me too :) Great review. Looks like a good product. Nice review. Thanks for sharing about Aloe Vera and Vitamin E NMF product that i also always used Organic skin Care products fro my skin by Mbotanicals and now i found this product also so interesting and i want to know that can i have i this product in UK?